Before the start of this 2018-19 NHL season, I previewed a list of three goalies to “boom” and three goalies to “bust” over the course of the year, providing an in-depth look at how I think a number of goalies will perform, and why. I also added a couple of honorable mentions who just missed the cut. Now after the Christmas break at the halfway point of the season, here’s a midseason followup on how each of my predictions is playing out. Enjoy! Alright, I know what you’re thinking. Glancing at the midseason stats above would indicate that Raanta has done anything but “boom” this year. The real reason that is, though, is due to the injury bug. Raanta has struggled with injuries since coming to the desert two years ago, and suffered his most recent one on November 27th in a game against the Minnesota Wild. 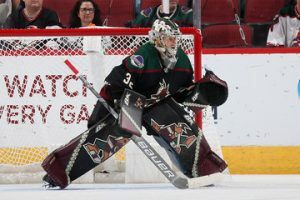 Coyotes General Manager John Chayka expected Raanta to recover rather quickly, however, Raanta suffered complications in a procedure he underwent on the injury expected to keep him out for the rest of the season, if not longer. I was really hoping this would be the year Raanta breaks out as a full-fledged number one, but alas, we have to wait a bit longer than we thought. When I penciled Hutton in as one of my picks to “boom,” I wrote, “Expect him to dazzle in his first year as a Buffalo Sabre.” Thus far, Hutton has done just that. 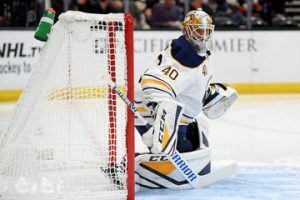 Holding down the crease for the Sabres while the rising star Linus Ullmark backs up and learns the ropes of the big leagues, Hutton has done just about everything Buffalo could ask of him. He’s led the Sabres to their best Christmas break record in years, and continues to play well while the Sabres hold on to their position in the standings, currently a playoff spot. If I hit the nail on the head with any one of these picks, Carter Hutton was it. 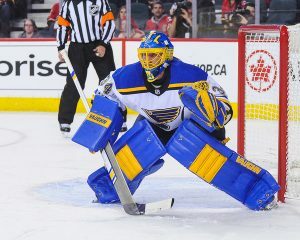 At the time I’m writing this, Jake Allen’s St. Louis Blues currently sit at 26th in the overall League standings. So, it would seem apparent I’ve missed with this pick. However, I’m not so quick to back down from Allen, or the Blues, as most people have been to date. When GM Doug Armstrong went “all-in” this past offseason with all of the acquisitions he made for his team, I was convinced they were a Cup contender. I don’t think that way now, of course, but I don’t think their roster is as bad as it’s been, nor do I think the underlying ailment is Jake Allen. His .903 SV% is indistinguishable from the League average, which is drastically lower this season across the board. If anything, Allen has been playing average– not bad. Just ride out the rest of the season with me and see how he holds up. Remember when I said Carter Hutton was the closest I came to hitting the nail on the head with any of these picks? Well, John Gibson is about as far from that nail as could be with any of these picks. 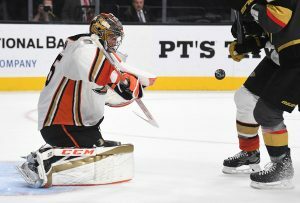 Gibson has proved me wrong in every way possible, his Anaheim Ducks currently in a playoff spot at the halfway point of the season, and his save percentage leading all goaltenders in the NHL. To be clear, I never doubted Gibson’s talent alone, rather the talent of the team in front of him, just a few months removed from a first-round sweep to exit the playoffs and badly banged up throughout the lineup this season. The fact that the Ducks are where they are in the standings is a testament to just how good of a goaltender John Gibson is. Brian Elliott is much like Antti Raanta in these rankings– I don’t think he’s really been given a fair shake this year, since he’s been out for an extended amount of time with injuries. He’s dealt with injuries for years, and his age considered, it’s no surprise as to why it’s kept him out so long. Using the fourteen games he did appear in as a sample size, Elliott actually performed pretty well (especially given the rest of the Flyers’ goalies this year). His .911 SV% is above the League average, and his 2.59 GAA encouraging enough to assume goal support could have offset it. It’s a shame he’s been kept out of the crease this season and hasn’t had a chance to prove himself. 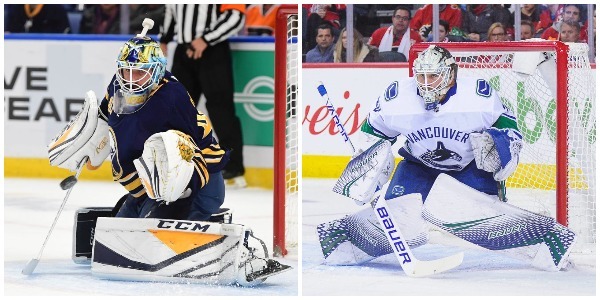 I gave the nod to “bust” to all three possible starting goalies for the Canucks at the start of the year: Jacob Markstrom, Anders Nilsson, and Thatcher Demko. Demko hasn’t appeared in an NHL game this season, and is playing down in Utica with the AHL affiliate Comets after recovering from a severe concussion before the start of the season. Meanwhile, Markstrom and Nilsson have been holding down the fort for the Canucks, with varied results. Nilsson has performed just about as well as I predicted. Although his .900 SV% is actually higher than a number of current starters on playoff teams, his 3-7-1 record indicates it’s simply not good enough. 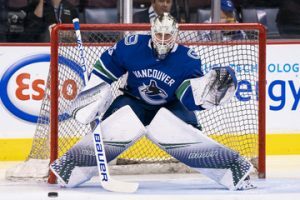 It’s going to be tough for the Canucks moving forward if they can’t rely on Nilsson on nights Markstrom may need some rest, and they are forced to overplay Markstrom down the stretch. A good backup is one of the most underrated positions in hockey, and Nilsson has made that apparent thus far. I’ll give a quick note on each of these goalies. Martin Jones has had a tough season with San Jose, but has picked up his play as of late, slowly improving his stats and keeping the Sharks at second in their Division. Philip Grubauer has excelled for the Avalanche and is slowly earning the starting spot as Semyon Varlamov regresses. 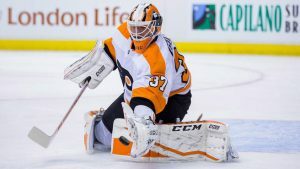 Matt Murray has been injured for much of the season, recently making his return after a long stint of Casey DeSmith between Pittsburgh’s pipes to salvage the season in Murray’s absence. Mike Smith has been incredibly streaky this year, making way for David Rittich to challenge the crease in Calgary. Smith still owns the starting job as we speak, but it remains to be seen who it belongs to come playoff time for the Pacific Division-leading Calgary Flames.